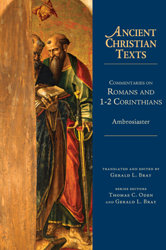 This Ancient Christian Texts volume, translated and edited by Gerald L. Bray, is the first of two that will offer a first English translation of the anonymous fourth-century commentary on the thirteen letters of Paul. Widely viewed as one of the finest pre-Reformation commentaries on the Pauline Epistles, this commentary, until the time of Erasmus, was attributed to Ambrose. The name Ambrosiaster ("Star of Ambrose") seems to have been given to the anonymous author of the work by its Benedictine editors (1686- 1690).